WebRunPro allows you to launch a program, open a document, run a .bat file, on your PC, by clicking a link inside an .html page! How many times a client asked you if it's possible to launch his/her favorite word processor by clicking a link inside an .html page? Now it's possible to launch any program with WebRunPro! WebRunPro is great for intranet applications. Create webrun links that point to your company's applications inside your intranet portal. Your users can now launch the applications by visiting the intranet portal page. Whitelist feature ensures that only certain commands are allowed to be run. No more icons on your users desktop! No need to update multiple icons on users desktop when you need to make a change to an application path! The first thing you need to do is download and install WebRunPro. If you have WebRun installed you must uninstall it first. Note that, webrun links will not work if WebRunPro is not installed. Then go to your html page and add a webrun link pointing to the executable, file or command you want to launch. A webrun link starts with "webrun:" inside the href attribute, followed by the executable, file or command you want to call. If your command includes double quotes you must replace each double quote with double exclamation mark - !! That's it! You may now click your webrun link to launch your application. If the application is not found, WebRunPro will just return a popup error. 1.To ensure cross-browser compatibility, use only ANSI characters in filepaths and WebRunPro links, UTF-8 filepaths do not work consistently across browsers. 2.The first time you click on a webrun link, your browser will ask you if you want to associate WebRunPro.exe with this type of links. If you click "remember", you will not be prompted again. WebRunPro prompts you to confirm every action by default. When you click on a webrun link, a popup confirmation box appears which indicates the exact command about to run. If you don't want to launch that particular command, just click the "No" button. This way you have absolute knowledge of commands lauched with WebRunPro. Block unauthorized command execution by utilizing the whitelist feature. Only commands inside whitelist.txt will be executed by WebRunPro, any other command will be blocked. Both security features of WebRunPro are configurable. Set your desired whitelist path and enable or disable the confirmation dialog feature. 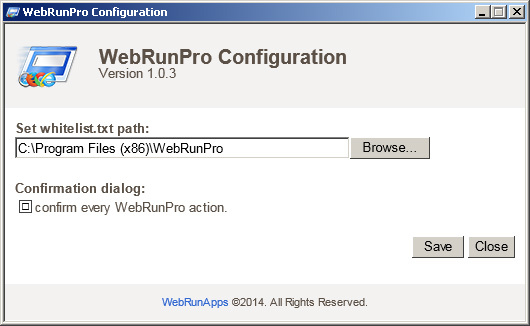 You can find WebRunPro Configuration on your installation folder (by default: C:\Program Files (x86)\WebRunPro\). Right click "WebRunPro Configuration.exe" and run it as administrator. -- Notice that double quotes are replaced with double exclamation marks. <a href="webrun:! !C:\Program Files\DAEMON Tools Lite\daemon.exe!! and for a good reason too. An attacker could exploit this feature and run malicious code on users PC. You use WebRunPro at your own risk, we recommend running WebRunPro in a sandboxed environment. How many copies of WebRunPro do you need? WebRunPro is aimed for use in business environment. A separate license must be purchased for each installation of the program. Installing the program on a server, or on a single workstation used non-simultaneously by multiple people, counts as one installation. Choose among available WebRunPro packages to find what best suits your userbase / needs.